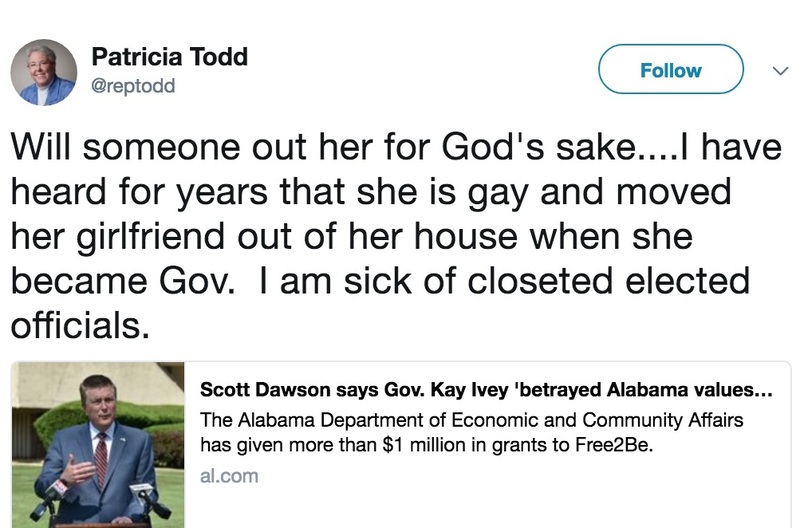 Thursday on his syndicated “Rick & Bubba” radio show program, co-host Rick Burgess, a supporter of Republican gubernatorial hopeful Scott Dawson, speculated on what might have caused Alabama State Rep. Patricia Todd (D-Birmingham) to post a tweet questioning the sexuality of Gov. Kay Ivey. Burgess’s comments were in response to a caller’s remarks about Todd’s tweet. The caller suggested the tweet set Ivey up for the sympathy vote in next month’s Republican gubernatorial primary, and he went on to add that Ivey would be an easier opponent for Democrats in November. Burgess made the case that Todd may have tipped off Democrats’ strategy for November in a possible general election setting, which he said was a good thing for Republicans.